I’ve been giving you tidbits about the tools I used to recover from adrenal fatigue syndrome, but now I’m ready to create a plan of action that you can follow. Most recently, I wrote about how I incorporated fat bombs into my protocol. Below, I’ll give you every step in my adrenal fatigue syndrome recovery protocol. When the adrenals become stressed due to poor diet, poor sleep habits, or high stress levels, they struggle to maintain all the functions they are responsible for, and adrenal fatigue syndrome begins to set in. When adrenal fatigue syndrome set in for me, I had been excessively tired for as long as I could remember. Then the fatigue got worse. I would wake up starving and spacey in the mornings, and would have not patience with my kids. When I realized my hair was falling out (a lot), I knew something was seriously wrong. I spoke with my practitioner about what was happening and it became clear: I had severe adrenal fatigue syndrome. It had come on fast, due to my body detoxing quicker than it was capable of handling, and I felt very out of control all of the sudden. It was really scary. I had eaten a grain-free, low-carb diet for years (read about our success with the GAPS diet), which was great for helping me recover from a number of ailments. But, as my adrenals began to struggle, it was time to up my carb intake. I ate sweet potatoes every day and began incorporating white rice several times a week. I enjoyed white potatoes again. Female stress and reproductive hormones need a fair amount of carbs to stay stabilized, and, for me, I needed to increase my intake. Read my in-depth article on how being too low carb might not be so good for you here. Sole water is one of the easiest and cheapest ways to support your adrenal glands. It’s made from only two ingredients, and packs a huge nutritional punch, as it’s chalk full of minerals. It’s made by putting one cup of mineral-rich salt (I’ve used both Real Salt and Himalayan salt) into a quart jar (with a plastic, non-reactive lid), then fill the remaining way with filtered water. Let sit overnight, then take a teaspoon each morning in a glass of water. I worked my way up to taking 2-3 Tbsp. a day. Read all about sole water here. Perhaps my favorite adrenal fatigue syndrome recovery tool, fat bombs are both incredibly healing and delicious! They’re made by mixing your fat of choice (good options are butter, ghee, and coconut oil) with some raw honey. I wrote in detail about fat bombs here. Not many people love liver, but it is a hugely important food to help heal the adrenal glands. Liver is full of vitamins and minerals, especially b vitamins, which helps support energy levels. Please read about how this superfood should be part of your adrenal fatigue syndrome recovery protocol here. Take liver capsules. This is the easiest way to eat liver every day. Just pop a few high-quality, grassfed liver capsules and you’re good to go. Get them here, or make your own with this tutorial. Thaw liver, soak in water with a little lemon juice or apple cider vinegar, then puree in a blender. Scrape into molds and freeze, then store in a sealed, freezer-safe container. Throw a couple into ground-beef meals, especially those with lots of sauce and spices, and no one will be the wiser! Adaptogenic herbs are those that adapt to what your body needs. They can be helpful to take in the morning to increase energy, but also at night to help you sleep because they lower cortisol (the stress hormone) levels. Adaptogens are especially supportive for the adrenals because they help the body deal with stress while supporting its ability to cope with anxiety and fight fatigue. I personally took ashwaghanda extract. Get it here. UPDATE: I later incorporated other herbs into my protocol and had huge success with rhodiola rosea. You can read more about how much I love it here. Not only is is important to be sure you’re getting to bed early (getting to sleep by 10 pm is really important to support you circadian rhythm- the internal clock that helps your body wake, sleep, and maintain energy levels), but you may need some extra help to sleep restfully. First- you should block out blue light once the sun goes down by installing blue light-blocking apps on your devices, or using tinted glasses like these. lavender extract- lavender is soothing and relaxing. Get it here. passionflower extract- passionflower calms the nervous system. Get it here. valerian root capsules- valerian relaxes the muscles and calms the nerves. It is a very stinky herb, so I choose capsules vs an extract. Get them here. Or learn to make your own herbal sleep remedy here. You may have to play with the dosage a little, but I’ve found that all three work together to help me sleep better, and if I remove one, it doesn’t work as well. Did you know that vitamin c is found in the highest concentrations in your adrenal glands? The adrenal glands use vitamin c to produce cortisol, so when your stress levels are high and constant, your body becomes depleted of vitamin c quickly. Unfortunately, the most natural, food-based vitamin C supplements are not enough to saturate your body with the vitamin C it needs. Instead, you need a more potent form, such as sodium ascorbate. To get my body fully saturated with vitamin C, I do weekly vitamin C “flushes.” I take one teaspoon of vitamin C powder every 15 minutes until my bowels become loose. However many teaspoons it takes is my bowel tolerance, and I take maintenance doses throughout the day the rest of the week. Vitamin C flushes have been critical for recovering my energy levels. The only vitamin C I have experience with and can recommend is this one. Finally, when you’re recovering from adrenal fatigue syndrome, you want to limit your intake of caffeine, which will further stress the adrenals. However, that doesn’t mean you don’t want to keep coffee around for other purposes. During adrenal fatigue recovery, you want to be sure you are supporting your detox pathways. Detoxing too quickly uses up the body’s resources and puts stress on the adrenals. I use coffee to do enemas in order to help my body flush out toxins quickly and keep my blood clean. They are really not as scary as they sound, and once you try them, you will feel so great that you’ll get over the “ick” factor. I wrote all about coffee enemas, including the what, why, and how, here. It took me a few months to feel like I was recovering, but now, over six months since my initial crash, I feel so much better, and I have lots of goofy baby hair growing! This hair regrowth, combined with stable energy levels, and a happier wife and mama, lets me know that I’m no longer suffering from the severe adrenal fatigue that was kicking my tail last year. Give my protocol a try, and you can begin healing from adrenal fatigue syndrome too! 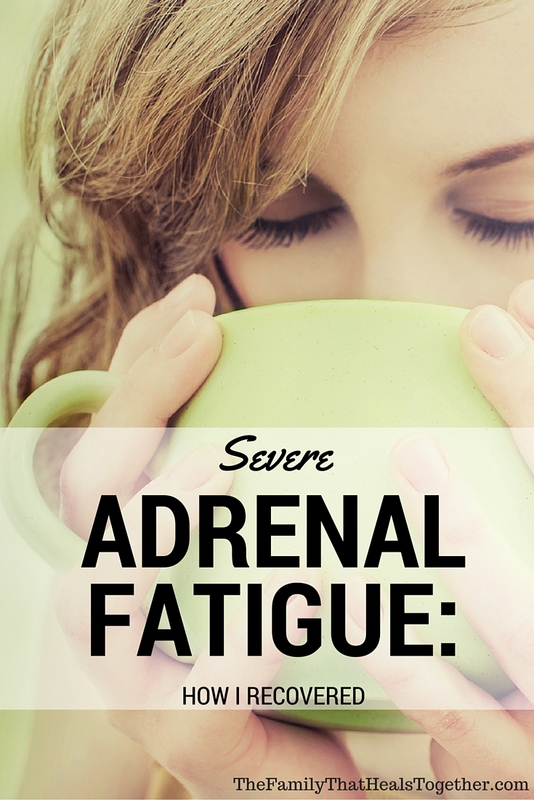 Have you suffered from adrenal fatigue syndrome? Share this article using a handy button below for friends who may also be suffering! 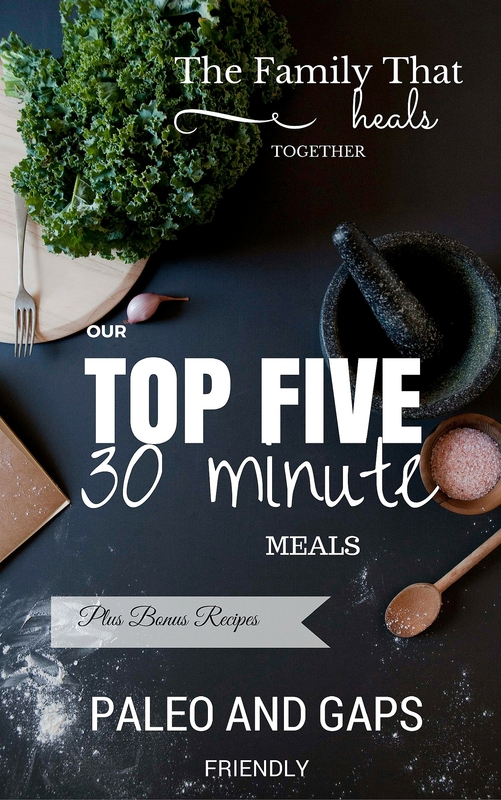 How to Make Sole Water, and Three Reasons Why You Should! Are You Taking Turmeric? Here’s Why You Should. Natural Migraine Remedies: Get Relief Now! As a Dr.’s wife, I would tell you no way on eating liver. It’s the filtration system of an animal…I will let you think about that for awhile…YUCK!!! Hi Pam. As a health and nutrition expert, I would tell you that grass-fed liver from responsibly raised animals is the most nutrient dense food on the planet. YUM! More and more research says quite the opposite about liver. Most healthier cultures eat mainly organ meats and throw out lean meats unlike us incredibly unhealthy Americans. Liver is a super food. But big Pharma and modernized doctors are about putting band-aids on problems, fixing issues would take away money they want. Liver is also an excellent source of iron. It also doesn’t keep what toxins it filters thru the body, it removes them. especially ethically raised grass fed animals. What if you’re allergic to honey? 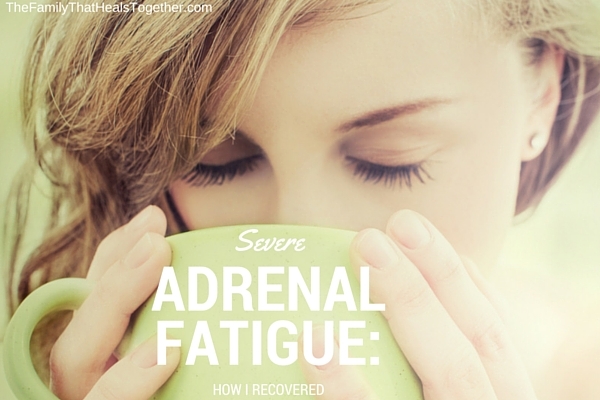 How was your adrenal fatigue diagnosed? I actually just chatted with my doctor over the phone and based on symptoms, he determined it was pretty advanced. Any ideas on how to get rid of tinnituw related to adrenal exhaustion? I was bed ridden for abou a month and am slowly getting stronger but the buzzing is super annoying!!! Hi Heidi. If I experience tinnitus, it’s typically after eating sugar or sleeping poorly, so that’s where I’d start: cutting sugar and getting good rest. Hi Ania. Yes, b12 deficiency would likely accompany adrenal fatigue, which is why liver is included in the recovery protocol. Hey there, I have a question about sole water. I’m having a hard time getting it all down. Do you think it’s ok to just take the teaspoon of the sole water all by itself and then chase it down with a glass of water? Or do I have to take it mixed in with the water? Thanks! I have been suffering from rocking vertigo for 7 months now with no known cause. It was brought on by a period of high anxiety/panic attacks. The feeling hasen’t left me since this happened to me in June. I have been researching adrenals as a cause because of how it started although im not seeing rocking vertigo as a normal symptom. I would say I experience fatigue too but the vertigo is the main problem. I think vertigo is a symptom of a greater overall systemic problem. My vertigo comes back if I get consistently poor sleep or if I consistently eat poorly (sugar, gluten, etc.). Hi! I have Addison’s Disease (primary adrenal insufficiency). Even though I am beyond the adrenal fatigue and am steroid dependent, can these tips still help? Hi Michelle- I don’t see why not, but you may ask your healthcare provider. Thank you for sharing your recovery process for your adrenals! This spring I began the journey to find remove things from my diet that irritated my adrenals, causing them to ‘crash’. In my search for healing, I found your article and it’s so encouraging! I do have a few questions though…. is the reason for fat bombs to give the adrenals rest from needing to help create energy (by eating ‘sugar’ multiple times an hour? and after they’re back to normal, the fat bombs won’t be necessary? That’s correct Miriam. The adrenals help to regulate blood sugar, so when the blood sugar frequently dips below normal, the adrenals have to work harder. Once blood sugar is stabilized and adrenals are functioning properly, fat bombs should not be needed. I gained 15lbs in 8 months. I have been diagnosed with adrenal fatigue as well I’m only 5ft tall so 15 pounds is a lot for me. How do I get this weight off? I am very concerned about prediabetes as well as Healing this adrenal issue. 37 year old woman. Thanks!! Lisa, diet changes are usually the first line of defense for weight loss. Cutting out sugars and empty carbs and adding in good fats and proteins is a good place to start. Have you had your thyroid checked? People with adrenal problems also have low thyroid. It can cause weight gain and exhaustion as well. Just a thought. Hi, I’m breastfeeding my 5 month old, I’m concerned that taking adaptogenic herbs isn’t safe while nursing. Do you have any feedback or experience with this? Hi Justine. I would just suggest checking each herb your’re interested in taking individually and decide for yourself. There is a lot of mixed information, and some of them simply have not been studied in breastfeeding, so you’ve just got to weigh your options. Honestly, I think you can eat them as often as you need to, although overdoing fats can cause loose stools. I only eat a few a day, simply because that’s as often as I remember. I have had anxiety/panic attacks for years and recently been through a lot of stress and have developed low blood pressure, dizziness and increased heart rate especially when walking around, and weakness, and sometimes episodes of dizziness where my blood pressure is high. I’m pretty sure this is adrenal insufficiency and I started taking 5,000mg vitamin C and started with 1tsp sole water and multi vitamin, and adrenal response supplement. I also follow a gluten free, soy free, dairy free with the exception of goat cheese. Is there anything else I can do to help? Hi Lisa. If you’re doing all that and still experiencing such extreme symptoms, I would suggest seeing a functional medicine doctor who can help you get to the bottom of your symptoms. I am responding to a comment from Brianna Caron regarding rocking Vertigo. It’s an old post, but finding an answer can be difficult…so I have to try to help. I have suffered for years with Vertigo. I was diagnosed with Silent Migraines after an MRI and a couple of visits to a neurologist. No treatment helped for very long. Many doctors and tests later, I had a two-week long episode and could barely lift my head or speak coherently. The doctor was out of ideas so she said maybe a physical therapist could help. She was right! I saw a therapist specializing in Vestibular conditions. It took her 10 minutes to determine the crystals in my ears were out of place. And…just 4 very nauseating minutes to correct the problem. She said I must have suffered for a very long time because I had the most severe reaction to her testing she had ever seen. It takes a short time for your system and brain to realize the issue has been corrected. But, a great deal of relief had come quickly. Within hours I was only dealing with the fatigue from the two-week ordeal. On occasion, I have to go back for a treatment but it is quick and painless. Obviously, there are other causes of Vertigo, but it is worth the time to check this possibility. My naturopath believes I am experiencing adrenal fatigue, brought on by stopping contraceptive medication. Over the course of 6 months, I’ve noticed significant hair shedding. I also have a lot of other symptoms of adrenal fatigue, as I’ve found through research. I’m interested to know how long it took your body to recover, and did your hair grow back? Hi Kim. I started feeling better pretty quickly, but it took months to feel like I was back to “normal.” Unfortunately, I have since gone through several big life changes and transitions that have caused an enormous amount of stress and have had symptoms return off and on. I have to be pretty diligent to avoid full-blown adrenal fatigue again.